After posting an ad teaser and a series of web banner ads promoting its new tablet, Motorola presented its entire full length Super Bowl spot for the Xoom tablet, packed with references to Apple in a bid to court iPad users. The new ad mixes imagery from Apple's iconic "1984" ad, which first introduced the Macintosh as liberating technology breakthrough, as well as "Lemmings," a more pointedly competitive spot Apple aired in 1985, which portrayed non-Mac users as blind followers who needed to remove their blindfolds to avoid catastrophic consequences. While Apple's "1984" is universally regarded as one of the best ads ever produced, "Lemmings" was immediately criticized as a failure for being perceived as negatively depicting the company's would-be customers as ignorant and misguided. Motorola's new spot for the Xoom tablet works to balance the two ideas together, portraying Apple's customers as ubiquitous clones wearing the same white earbuds and blank uniforms, but injecting a sympathetic storyline where a Xoom-using man flirts with a girl using images presented on his tablet. The girl then responds to his advances by removing her white iPod earbuds. Drones in white portrayed in the ad are depicted listening to small handheld iPods, but none are shown using an iPad. To a casual observer, the man using Motorola's Xoom might be mistaken for being an iPad, as all that's shown of the new tablet is its virtual page-turning in a nondescript ebook reader app (reading George Orwell's "1984"), Google Maps (featuring Android-only 3D building views that most viewers are unlikely to catch), and the camera app new to Android 3.0 Honeycomb. A brief animated cartoon depicting a stick figure man giving flowers to a stick figure girl, and published to the man's own tablet via YouTube, perhaps using the Android-only Adobe Flash, is shown (as opposed to just giving her the flowers, something that doesn't require an $800 tablet), but it is not explained how the photo of the flowers the man takes was converted into the animation. Apple's own iPad ads have focused on more obvious and practical applications of the device via its library of as Apple claims, more than 60,000 unique apps. Recognizing the shots of the new tablet as being distinct from an iPad would require a technophile enthusiast's understanding of the differences of the two, which is never presented in the spot. Instead, the new tablet is only identified briefly by name at the end of the clip, "Motorola Zoom with Google, the world's first Android 3.0 tablet," with none of its unique features ever been expressly noted. Motorola's new tablet boasts a slightly larger screen and resolution (10.1 inches, 1280x800) than Apple's existing iPad. It also uses a cinematic 16:9 display ratio aimed at watching movies, contrasted with the more computer-like 1024x768 resolution of the iPad's 9.7 inch screen and its portrait-oriented dock, aimed more at productivity apps like Apple's own Pages, Numbers and Keynote. Internally, Motorola's Xoom tablet uses a faster dual core Nvidia Tegra 2 SoC, roughly similar to the new Texas Instruments chip used by RIM's PlayBook; both are a full generation ahead of the Apple A4 SoC used in last year's iPad and the similar Samsung Hummingbird chip used in the Galaxy Tab. Xoom also includes 1GB of RAM, four times as much as the existing iPad. The Xoom also includes dual cameras; a 2 megapixel front facing camera for video chat and a 5 megapixel rear-facing unit with 4× digital zoom and auto focus, capable of 720p video capture. Apple's existing iPad has no cameras, while the coming iPad 2 refresh is expected to add a much simpler VGA FaceTime camera and basic 1 megapixel rear camera identical to that being used in the iPod touch, rather than the significantly better 5 megapixel camera used by iPhone 4. Xoom is, according to an Engadget report, expected to become available February 24, in a CDMA/EVDO 3G-only version sold by Verizon for $800. The unit will be accompanied by optional data plans that start at $20 32GB per month for 1GB, but an ad from BestBuy also notes that "to activate WiFi functionality on this device, a minimum of 1 month data subscription is required." Unlike the iPad, there are no cheaper WiFi-only versions of the Xoom. Update:BestBuy is currently running a sale on 3G iPads, which takes $30 off each model, resulting in the equivalent 32GB 3G iPad costing $700, or $100 less than the new Xoom. The 16GB 3G iPad is $600, while the 64GB 3G iPad is $800. WiFi only iPads are not on sale, so they cost $100 less than each of the the 3G versions. Users do no need to buy 3G service in order to use WiFi. 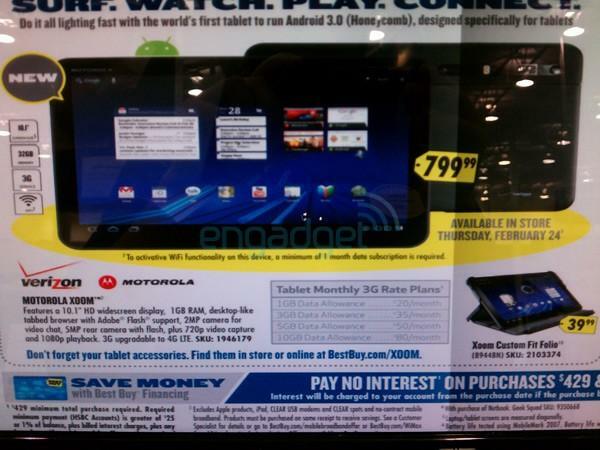 Toshiba is expected to release its own Honeycomb tablet with hardware very similar to Motorola's. Toshiba launched a product site for its new tablet using Flash, which blocked visitors using an iPhone or iPad, displaying a teaser message indicating that site required Flash, something iOS doesn't support. However, the company also created a plain HTML mobile version of the site that works fine on iPhones and iPads, and simply made it impossible to accidentally discover.